On our last day in Korean class, our professor (Li) performed a traditional Korean tea ceremony for us. Being a tea enthusiast myself, I was uber excited at this, and started snapping pictures right away. He is a major tea enthusiastic who swears by tea - and he's a living proof of it! He's 76 years old but still energetic like a 25 year old, who for the past 25 years drank only tea, and "not a drop of coffee has touched my lips" in his own words. Just as every culture has a tea "ceremony", Korean tea has its uniqueness, though it is almost the same as Chinese teas. 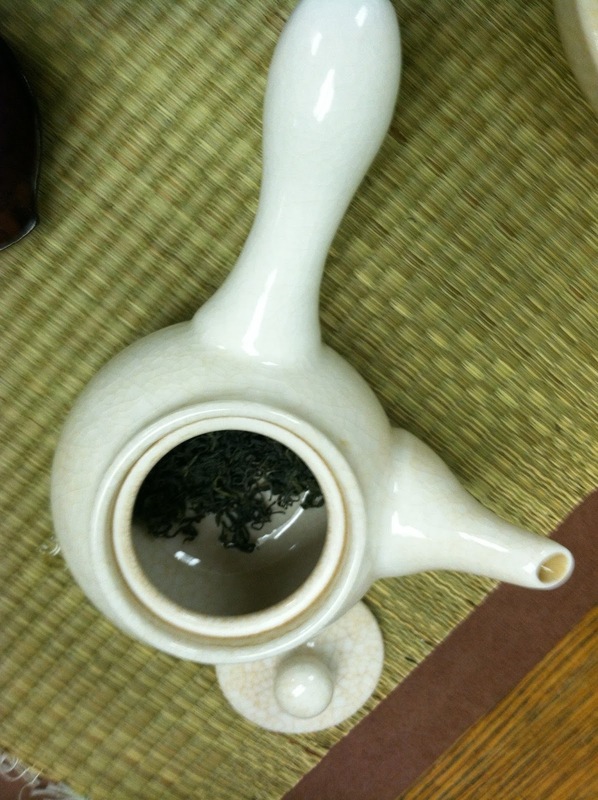 In fact, tea was first brought to Korea by visits to the Tang dynasty in China. 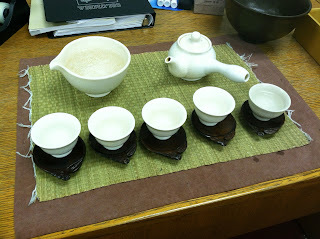 Let's start with the teaware - Korean tea sets are mostly ceramic, fired in a kiln. 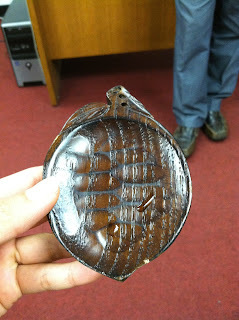 But during the process, the door is opened to channel some cool air, thereby "breaking" the glass. 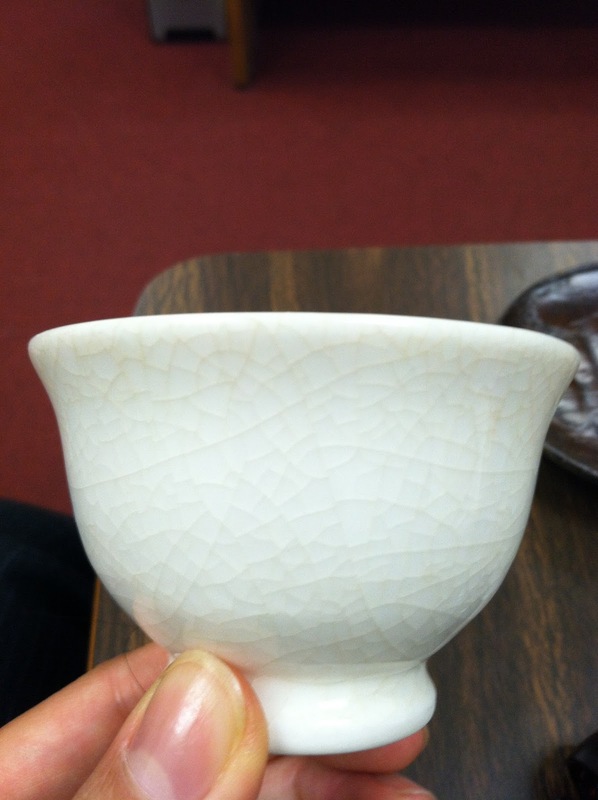 That's why you'll see fine cracks on the ebony teaware like fine cracks of an eggshell. Each teacup rests on a shiny wooden coaster with an elegant design of a leaf. The design is so simple yet elegant. 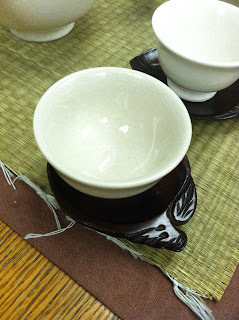 All of the teaware is placed on a wooden mat to instill a sense of natural organic-ness. 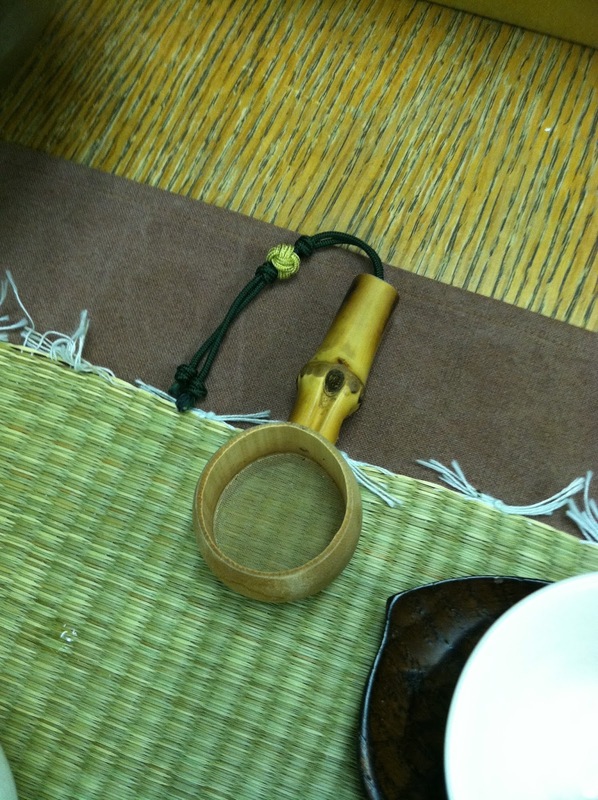 Unlike the clay teapot that I bought from Taiwan, this one doesn't have a tea leaf filter built in the inside, so you'll have to get an accompanying tea mesh filter. I thought this design was pretty neat, especially the beaded detail on the string. 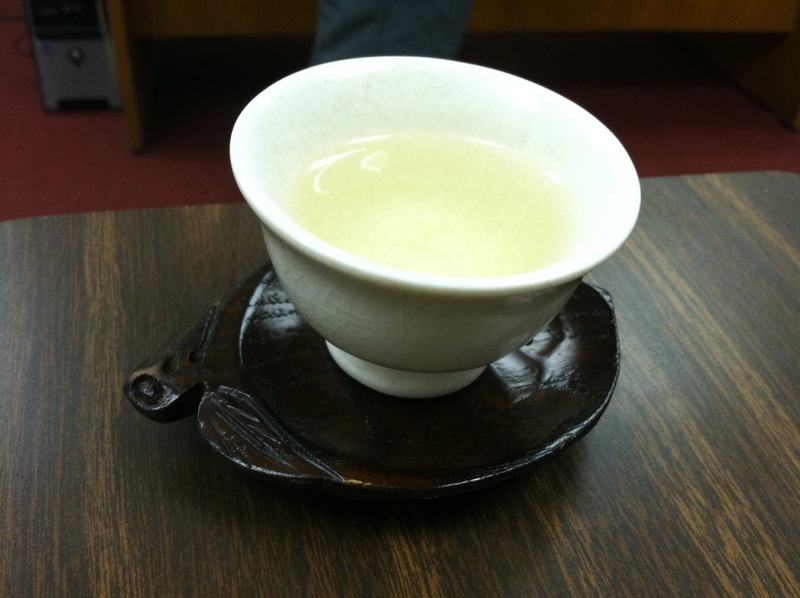 In ancient times, tea is used as a form of meditation.Our Korean teacher fully agrees - he says he drinks tea for at least 30 minutes everyday, to help calm his mind and body. Tea is best drank with a peaceful mind, and even if you have friends over for tea, everyone engages in positive conversation (that means indoor voices). I like how they incorporate natural elements to their teaware to instill a sense of oneness between man and nature. 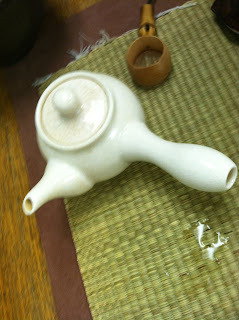 Then you pour in the boiling water into a large ceramic teaware like the one pictured upside down above. 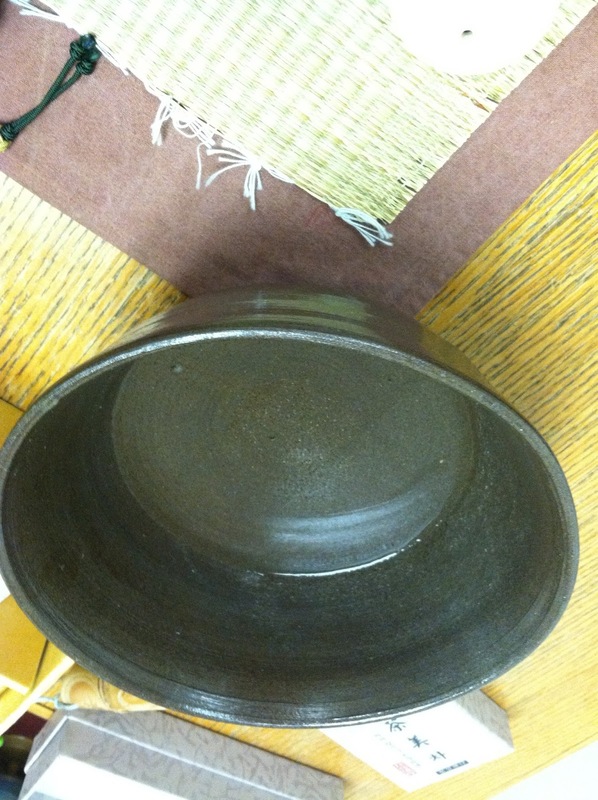 This is a pretty big bowl. Then you pour the water from that bowl into the teapot. After two minutes of infusing, pour the tea from the teacup into the medium sized bowl (first picture). 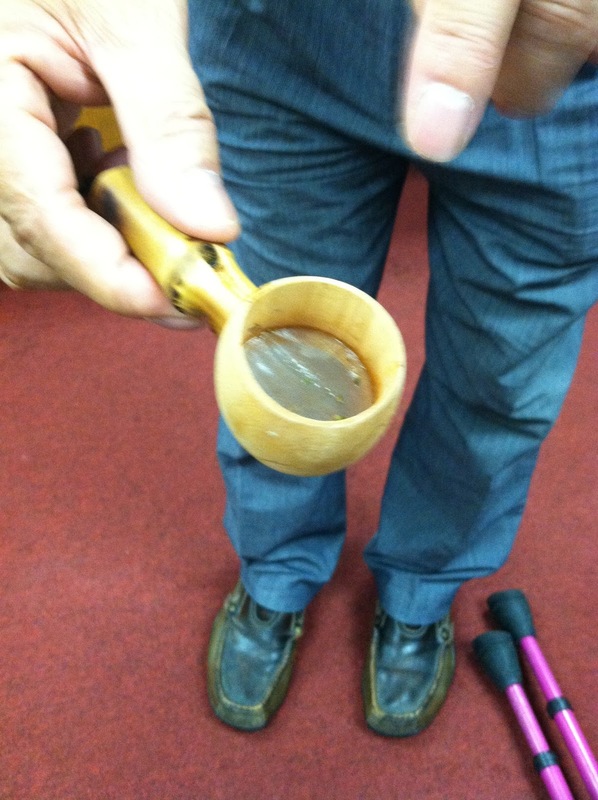 Finally, the tea is poured into each cup from the medium-sized bowl through the mesh filter to drain out excess tea leafs. The way that the tea is poured is also a technique - because the richer tea settles to the bottom, each cup is poured halfway before going back for another round to pour it the whole way. This way each cup gets an equally infused tea. 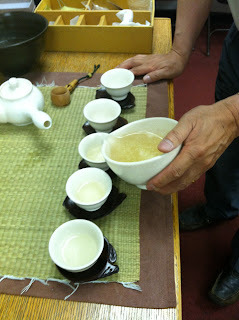 Instead of washing the tea as in Chinese gong-fu style tea, the first brewing is never thrown away. Professor Li says that the first brewing is always the best. The tea leafs that we used were harvested from the Jirisan Mountains near the Ssanggyesa Temple. 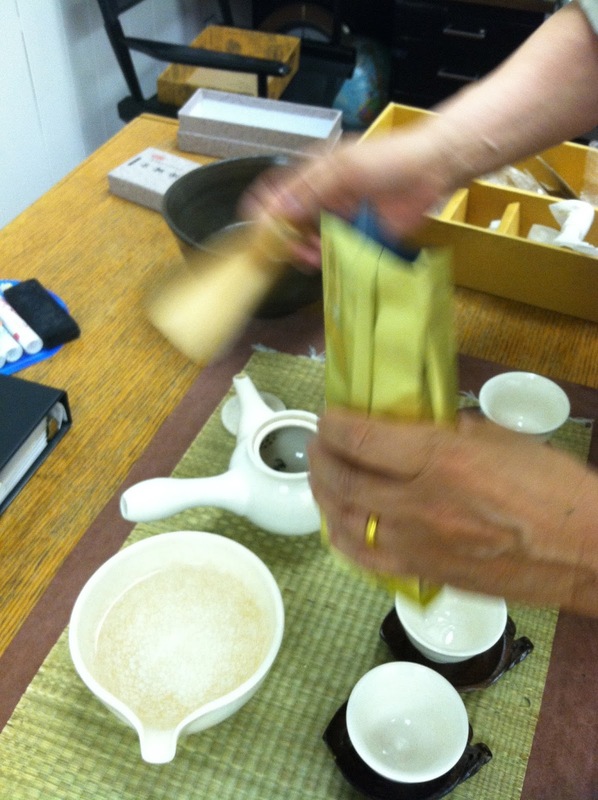 Speaking of temples, this particular tea was harvested and given to him by a Buddhist monk. The tea smells almost like corn, and carries a very flagrant and mild taste. You really have to settle into it to savor its full taste, because unlike western teas, the beauty of this tea lies in the meditative mood it evokes. Even though the teas are harvested at a relatively low elevation (around 300m above sea level), they bear the same quality and taste as oolongs from Taiwan, because the water and soil in the Jirisans are the most suitable for tea tree growth. 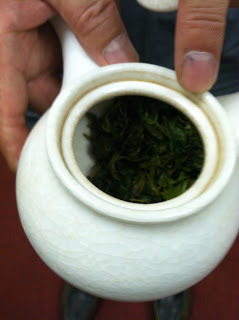 Professor Li told us that the tea trees (without fertilizers) can grow as deep as 5m beneath the ground. 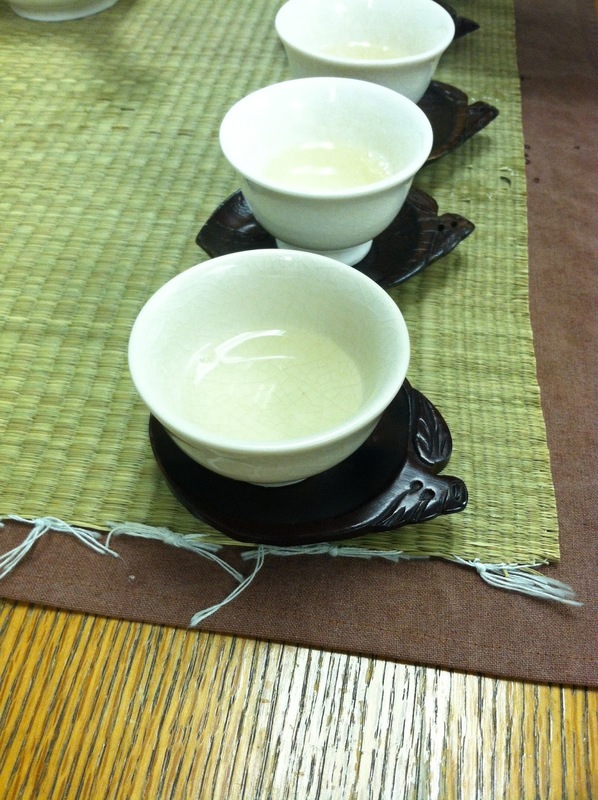 Korean green tea is prepared in a similar way to Chinese greens, with hand-picked tea leafs that is heated in a wok until it becomes dry. But it doesn't come vacuum sealed like Taiwanese teas. After brewing the tea, you can see the tea leafs fully expanded this one pictured above. 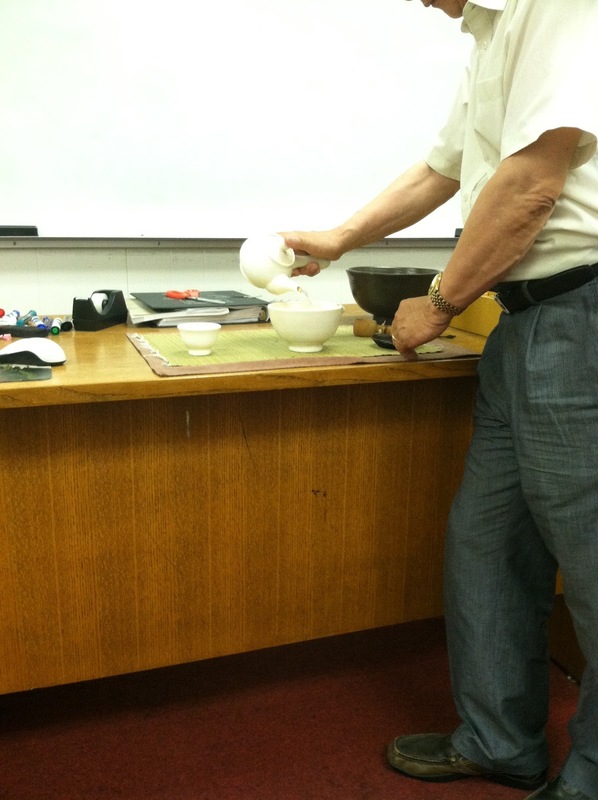 Professor Li told us that he goes hiking in upstate New York every Sunday, bringing with him his entire tea set and some hot water. He gets up at 5am, drives there, hikes up the mountain, gets to the summit, does 1/2 hour of meditation and performs a tea ceremony with his friends, then goes to church at 8am. For a 76-year-old, that's crazy! 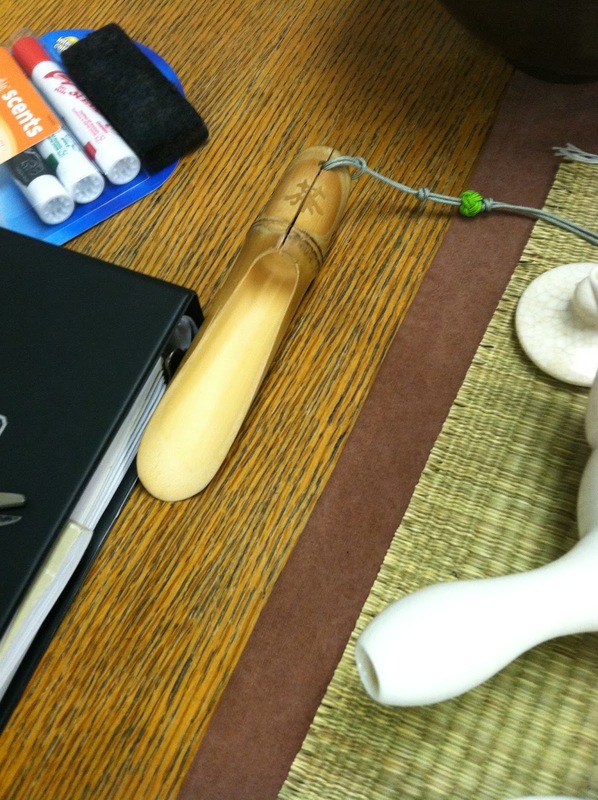 We were really thankful for this culturally enlightening experience, and I'll be sure to visit him if I need some Korean tea! Homecooking 101 --- Real. Simple. Dinner.